The Monroe County 911 Center received the call in the predawn hours of Tuesday, August 18, 2011. The caller claimed he discovered his “aunt” slumped over in her wheelchair not breathing. The dispatcher offered to instruct the caller on CPR while an ambulance was dispatched to the home. The caller hesitated, explaining that getting his Aunt out of the wheelchair may cause fractures to her legs. Several offers of encouragement by the dispatcher were rebuffed each time by the caller. You see, the caller, John Tedesco, knew that CPR was a waste of time. His so-called aunt had been dead for hours. Indeed, rigor mortis had already set in. Barbara Rabins, age 70, was discovered by the responding EMTs dead in the home of John and Tina Tedesco. The Coroner’s office was contacted and a deputy coroner duly arrived to carry out the traditional functions of her office. The deceased was officially pronounced dead. Her background information was sought from Mr. and Mrs. Tedesco. They claimed she had been living with them for years, that she had suffered a stroke the year before, and her health had declined. The couple claimed she had been fed a dinner of cheese cut into pieces and water the evening before. Afterwards, John went to work and Tina noticed that Barbara appeared to be sleeping around 11:00 pm. John claimed that he discovered Barbara dead when he returned home. Yet things weren’t adding up. The answers the deputy coroner was receiving were guarded. The Tedescos claimed that Barbara lived with them, spending much of her time on a couch in the living room, yet the cleanliness of the couch and the home in general was in stark contrast to Barbara’s body. In the dim light of the room, Barbara’s body could not be closely examined, but the odor was overpowering. Human waste was the predominant smell. The body appeared dirty; dressed only in an oversized tee shirt, soiled adult diapers, and a pair of white socks. Rigor mortis had already set in. This, the deputy knew, meant Barbara had been dead for about 8 to 12 hours. With the help of the ambulance crew, the mortal remains of Barbara were loaded into the Coroner’s van for transport to Pocono Medical Center. Once there, deputy coroners examined the body under the bright lights of the morgue. They were horrified at its condition. Human waste was observed caked and dried under long thick curved fingernails of her apparently paralyzed right hand. They discovered multiple stage four pressure ulcers exposing bone, cartilage and muscle tissue on her tailbone, elbow, chest, and foot. Dozens of lesser pressure ulcers, in various stages of severity, were seen throughout her body. An overwhelming odor of infection, waste, and decay hung over the corpse. Infected scratch marks covering her buttocks and lower torso torso were identified. Her rib cage was easily seen under her shrunken abdomen and shriveled skin. The State Police were contacted, advised of the circumstances,and an autopsy scheduled. The autopsy further revealed the deplorable condition of the body. Dozens of pressure sores were examined and photographed. Samples from the open wounds were tested for the presence of various bacterial “colonies”. The pathologist also uncovered the immediate cause of death – a piece of mozzarella like cheese stuck in her windpipe. Chemical findings indicated severe dehydration as well. The photographs from the autopsy are among the most disturbing post-mortem photos I have ever seen. Their value as evidence of John and Tina Tedesco’s extreme indifference to the value of human life was immense. Now began an official death investigation. The District Attorney’s Office approved a search warrant for the Tedesco residence. 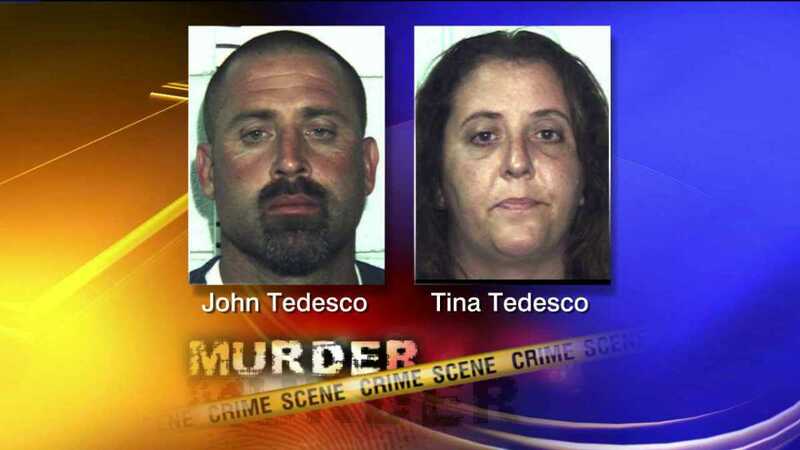 At the same time the house was being searched, investigators interviewed John and Tina Tedesco. Their statements were full of contradictions, misstatements, and omissions. By court order, the District Attorney’s Office obtained all known medical records of the victim. We also obtained the services of a certified wound care nurse with extensive experience in the treatment and prevention of pressure ulcers. We had the nurse review the medical records as well as the photographs of the body. Her studied opinion was that this was the worst case of elder abuse / neglect that she had ever encountered. The case then went through the the county investigating grand jury. 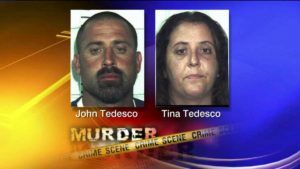 The jury issued a recommendation that John and Tina Tedesco be charged with Murder of the Third Degree, which under these facts meant that John and Tina Tedesco caused Barbara’s death under malicious circumstances. The jury also recommended that charges of Neglect of a Dependent Care Person, Theft, and Tampering with Evidence be charged. Barbara had been a special needs person. Her father had been a wealthy dentist. Prior to his death, Dr. Rabins set up a trust fund through an out of state bank for Barbara’s benefit. Barbara’s trust fund had over two hundred thousand dollars in it throughout the time period that the Tedescos were “caring” for Barbara. They managed to convince the out of state trust officer that they were providing love and top notch care to Barbara. They claimed that Barbara was living in their home like a member of their family. Indeed, both of the Tedescos repeatedly claimed to the police that Barbara was like a mother figure to them. In exchange for their “love and care” Barbara’s trust fund was paying the Tedescos over $3,300.00 per month. Tina Tedesco also finagled Barbara’s monthly social security check of $1050.00 Dollars to be deposited into an account she owned. All in all, practically all of the Tedescos bills were being paid for by Barbara. The monthly amount exceeded $4,500.00. This did not include thousands of dollars for Barbara to go on vacations with the Tedesco family. In fact, Barbara did not even get to go on vacation. To make matters even more depraved, investigators discovered that Barbara was not living in the Tedesco’s fine home. Rather, she was kept in a filthy run down apartment about five miles away. At times, she shared the apartment with a disabled army vet with mental health issues. John and Tina had insinuated themselves into this man’s life as well. With parasitic efficiency they gained control of his finances. They were taking about three thousand dollars a month from the man’s accounts before his long term hospitalization at the VA Hospital in Wilkes Barre put an end to their schemes. No such safeguards protected Barbara from their predations. Indeed, following a stroke about a year before her death, Barbara was by necessity hospitalized and then transferred to a rehabilitation facility. When Barbara’s insurance coverage ran out, the Tedescos insisted on removing Barbara from the facility against medical advice. They conned the bank trust officer and the local aging office that they would hire round the clock care for Barbara. Instead, they stuck her into the filthy apartment and dropped by now and then to check on their investment. The best laid plans of her loving and caring father went for naught. A year later and a hundred pounds lighter Barbara came to her brutal end. Choking alone, helpless paralyzed, and filthy. Her decayed corpse removed from the scene and driven to her “caretakers'” home. A story concocted and the 911 Center called. Trial was scheduled to begin on January 6, 2015, with jury selection. However, the defendants elected to plead guilty to the most serious charge – Murder in the 3rd Degree. Later, changing their minds, the defendants withdrew their guilty plea and elected to go to trial. On August 14, 2015, after more than a week of testimony during trial, a jury convicted the Tedescos of Murder in the 3rd Degree. In working on this very difficult case, I had the excellent Investigative team from the PSP Lehighton Barracks. In particular, Trooper Nicholas De La Iglesia. I also had the invaluable help of County Detective Wendy Serfass and Assistant District Attorney Kelly Lombardo.